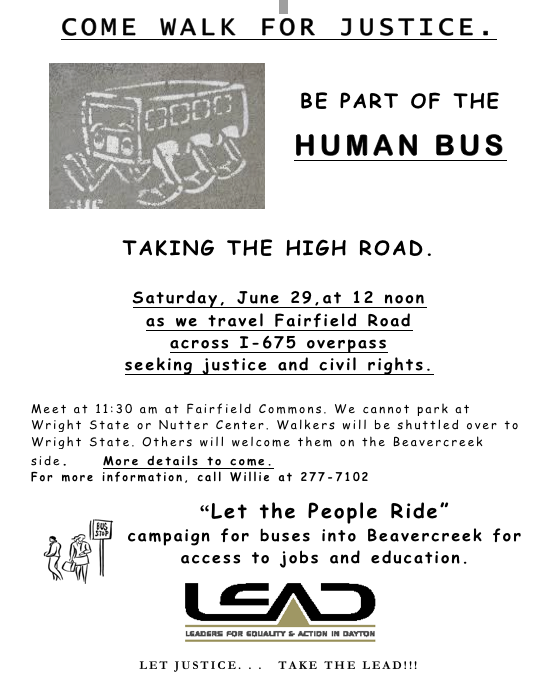 This walk is to protest the refusal of Beavercreek City Council to allow bus stops on Pentagon Blvd near the Fairfield Commons mall. The Greater Dayton RTA has been trying to extend the #1 bus route, which runs from Dayton to Wright State University, to the mall area, allowing people without cars to access jobs and medical services at the mall and the new Soin hospital. Now, people without cars have to take the bus to Wright State, then walk across the I 675 overpass to the mall and hospital area. Beavercreek Police told us that it was "too dangerous" for us to march over that bridge/overpass, so we will have police coverage to protect us. Of course, those who walk it daily do not have that protection. The Greater Dayton RTA has been working to get these bus stops for about 10 years and LEAD (Leaders for Equality and Action in Dayton) has been involved for over 3 years. There is no cost to Beavercreek but they have said that they do not want "those people" coming to that area. We have filed a complaint with the US Dept of Transportation, saying that it is discrimination. We are waiting for a determination from the USDOT at any time. 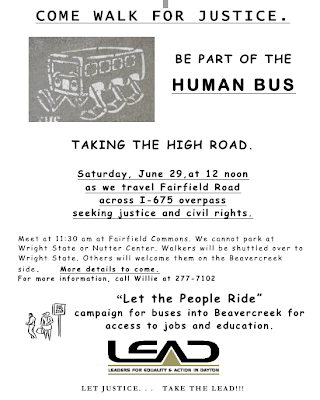 Here are the details for this "Human Bus Walk" in Beavercreek. We need as many people out as possible. So, please pass this info on to anyone you can. If you have any questions, please contact Paula Ewers at 937-902-6508. The Walk is on Saturday, June 29th at noon across the I-675 overpass on N. Fairfield Rd. We will meet at 11:30 at the Fairfield Mall near the flags on Fairfiled Mall and Pentagon Blvd. and transport people over to the starting point which will be near the Nutter Center on Colonel Glenn. The march will finish near the mall at the corner of N. Fairfield and Pentagon Blvd. If people don't want to walk, then they can be the supporters at the end of the walk and cheer us on. We do have police support and protection for the walk across the bridge and to the finish area. Even tho' they told us, " it was too dangerous to walk", they are closing a lane of traffic so we will be safe. We are expecting the response from the US Dept of Transportation, regarding the complaint that was made by LEAD and our ABLE lawyers, at any time. We hope we will have it before the "Walk".